Science After Retirement: Do Rain Gardens Make Vacant Parcels Better for Runoff Control? Do Rain Gardens Make Vacant Parcels Better for Runoff Control? One of the purposes of the Vacant to Vibrant Project is test the effectiveness of rain gardens in controlling runoff. We assumed that rain garden installation would improve both the retention and processing of runoff following rain storms and established sets of control and experimental parcels in each of the selected neighborhoods to test this assumption. The purpose of this blog post is to present results of the test of this fundamental assumption. Surprisingly, I find only marginal support for the assumption. At the beginning of the project, it seemed reasonable to assume that rain gardens would have greater infiltration, greater short term storage of runoff, and greater rates of evapotranspiration than untreated vacant parcels. The advantages of rain gardens over mowed vegetation cover derived from the higher porosity of rain garden soils and higher rates of evapotranspiration by rain garden plant cover. By pairing experimental and control vacant parcels in the three cities, the experimental design of the project provides data to test this assumption. Experimental parcels included primary and secondary rain gardens (site descriptions) and control parcels all had mowed lawns that were planted and maintained after home demolition. Although there were unexpected problems with monitoring all experimental and control parcels of the three neighborhoods, we were able to obtain data for three experimental and one control parcel in both Gary and Buffalo neighborhoods and continuous monitoring of one Cleveland experimental parcel. As explained in a previous blog post (here), monitoring of soil moisture provides data to evaluate variability among controls and experimental parcels due to both infiltration and evapotranspiration. Soil moisture monitoring at three depths (3cm, 10 cm, and 20 cm) in the primary rain gardens of the experimental parcels and at a central location in the control parcels yields data for analysis of profile changes and soil moisture content in the upper 20 cm of soil. All rain gardens had a maximum depth of 25 cm. Native soil types for the parcels varied among the three neighborhoods, with Gary having sandy-loam soils, Cleveland clay dominated loams, and Buffalo with compacted loam soil. Figure 1 illustrates the differences in amplitude of variation of Buffalo and Gary parcel soils at 20 cm depth. The greater amplitude of variation in soil moisture in Gary parcels is likely the consequence of greater porosity of the underlying sandy soils. I used a depth-weighted average soil moisture to estimate the average soil moisture of the upper 20 cm of monitored profiles. Figure 1. 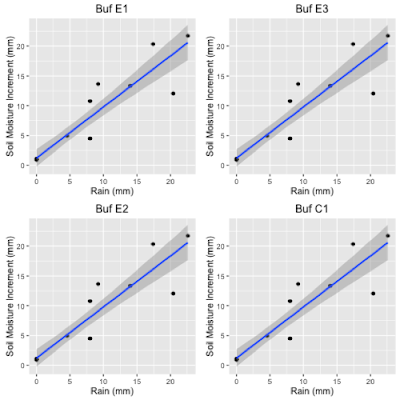 Comparison of soil moisture variation in Gary and Buffalo parcels at 20 cm depth. Parcels in Gary are as follows: 1200 Oklahoma (Gary E1), 1035 Oklahoma (Gary E2), 1252 Dakota (Gary E3), and 910 Idaho (Gary C1). Buffalo parcels are 608 W. Utica (Buf E1), 41 Lawrence Pl (Buf E2), 247 Massachusetts (Buf E3), and 52 Lawrence Pl (Buf C1). 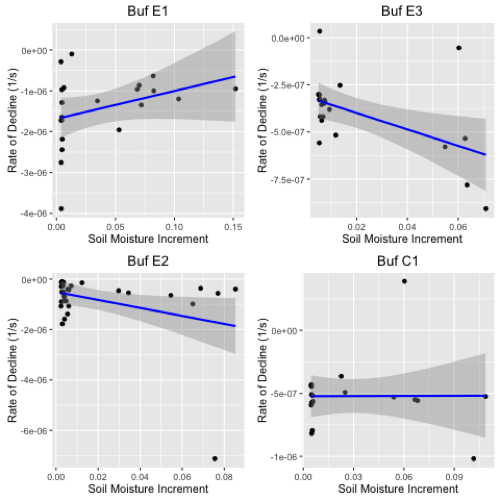 Using weather station data Gary and Buffalo neighborhoods, Figures 2 and 3 illustrate the dependence of soil moisture increments on rain fall. Unfortunately, damage to the control monitoring equipment for Gary control parcel halted observations after July 7, 2016. As shown in Table 1, nearly all of the correlations between rain amount and soil moisture increment (estimated as the product of the 200 mm maximum depth of the soil moisture probes and the weighted average soil moisture) are statistically significant, with Gary E1 and C1 as exceptions. 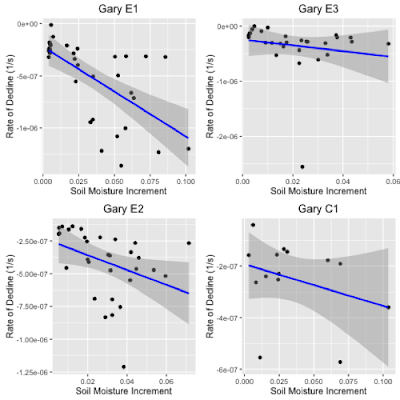 The mean ratios of soil moisture increment to rain fall in Table 1 indicate that Gary rain garden soils retain less of the input rainfall than the control parcel. In Buffalo, however, all parcels retain much more of the input rainfall with less difference between control and experimental parcels. The single Cleveland experimental parcel is similar to Buffalo parcels. Overall, therefore, the large soil moisture increments reflect the general expectation of a mass-balance relationship with rainfall. Figure 2. Relation between observed rainfall and soil moisture increment in Aetna parcels over the interval June 15 to August 29, 2016. Shown are the least squares regression line (blue) and the 95% confidence interval (shaded). 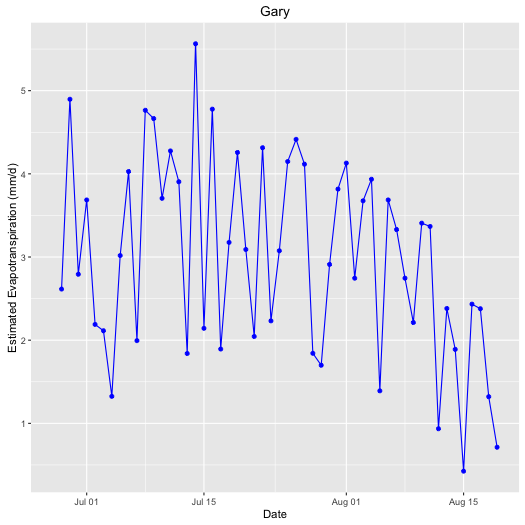 Correlations for Gary E2 and E3 are statistically significant at the 0.05 level. Figure 3. Relation between observed rainfall and soil moisture increment in parcels within Buffalo’s PUSH neighborhood over the interval June 8 to August 29, 2016. Shown are the least squares regression line (blue) and the 95% confidence interval (shaded). All correlations are statistically significant at the 0.05 level. Table 1. Association of rainfall and soil moisture increment in Vacant to Vibrant parcels illustrated in Figures 3 and 4. Parameters included are r (correlation coefficient) p (p value of correlation), B1(regression slope parameter), and mean ratio of soil moisture increment to rainfall. As discussed in previous post (here), the rate of decline of soil moisture following a rainfall event is a useful estimate of infiltration. Patterns of association between soil moisture increment and post-rainfall decline, however, are highly variable (see Figures 4 and 5, and Table 2). Only four of the nine parcels have statistically significant correlations, so inferences are limited. Of the four statistically significant correlations (Buf E2, Buf E3, Gary E1, and Gary E2), the Gary regression slopes are greater, reflecting the greater porosity of the native soils as in Table 1. Because mowed lawns ought to have lower infiltration rates than the more porous rain garden soils, the control parcels should have lower slopes as is the case in Figures 4 and 5. 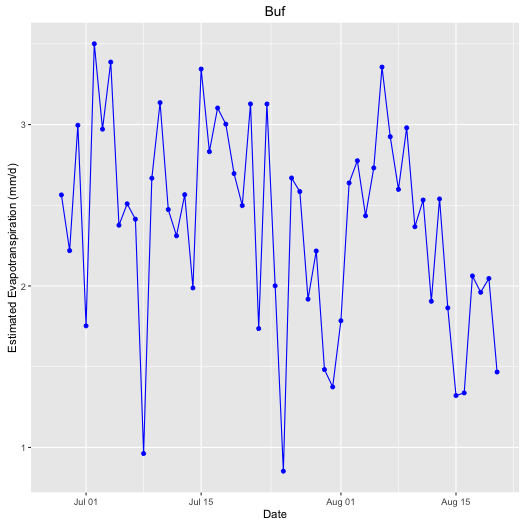 The pattern for Buffalo E1 (608 W. Utica) is anomalous. The mean decline rate following rainfall for this parcel is -1.43e-06 (1/s) which is higher than the mean of the other parcels in Buffalo. The co-location of a nursery on this parcel also complicates inference about its infiltration characteristics. The remaining parcels (Gary E3 and Cleveland Hulda) with non-significant correlations are generally consistent with expectations. Overall, there are indications that the rain gardens do have higher infiltration rates than control parcels, but the evidence is equivocal. Figure 4. Comparison of relations between soil moisture increment and subsequent rate of decline from four parcels in the Aetna neighborhood over the interval of June 14 to August 29, 2016. Experimental parcels (E1, E2, and E3) have rain gardens and the control parcel (C1) does not. Figure 5. 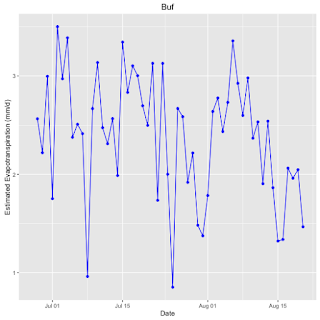 Comparison of relations between soil moisture increment and subsequent rate of decline from four parcels in Buffalo’s PUSH neighborhood over the interval of June 8 to August 29, 2016. Experimental parcels (E1, E2, and E3) have rain gardens and the control parcel (C1) does not. Table 2. Summary of dependence of rate of decline on soil moisture increment associated with rainfall events for parcels in the Vacant to Vibrant project. An * denotes significant correlation coefficient at the 0.05 level. B1 is the slope of the regression in Figures 4 and 5. Mean decline rate data only include initial decline rates for rainfall increments in soil moisture. Comparisons evapotranspiration losses of experimental and control parcels requires estimates of potential evapotranspiration. I prepared an R-script (RET_Calc.R) to estimate evapotranspiration potential based on the January 2005 ASCE-EWRI Task Committee Report (link) assuming a tall coverage crop. Figures 6 and 7 show patterns of variability of reference evapotranspiration rate based on local weather station data collected in the Aetna neighborhood of Gary and the PUSH neighborhood in Buffalo. The patterns vary with incident solar radiation, temperature and relative humidity. Mean values are 3.43 mm/d for Gary, 2.33 mm/d for Buffalo, and 4.18 mm/d for a weather station in Cleveland's Woodland Hills neighborhood. Sufficient data were available to estimate daily rates of soil moisture loss for seven multiday intervals in both Buffalo and Gary and four multiday intervals in Cleveland. Table 3 summarizes the variability in loss rates for all nine monitored parcels. As in Table 2, the Buffalo E1 parcel has an anomalously high ratio of mean loss rate to reference evapotranspiration. Otherwise, the control parcels seem to have equal if not higher rates of evapotranspiration than the rain garden parcels. Figure 6. Estimated reference evapotranspiration based on the ASCE-EWRI recommended method. Weather station data were obtained from the Aetna weather station for June 27 to August 19, 2016. Figure 7. 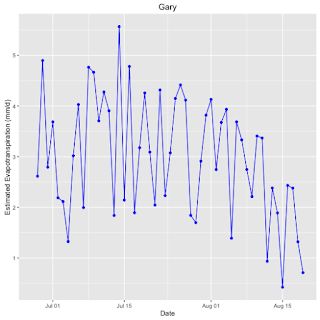 Estimated reference evapotranspiration based on the ASCE-EWRI recommended method based on weather station data from the a weather station in the PUSH neighborhood over the interval June 27 to August 20, 2016. Table 3. Summary of mean loss of soil moisture over multiday intervals in the Vacant to Vibrant project parcels. MLR is the mean daily loss rate and RET is the mean daily Reference Evapotranspiration. Mean RET values were 3.43, 2.33, and 4.18 for Gary, Buffalo, and Cleveland, respectively. Given the high porosity of rain garden soils and the types of vegetation in rain gardens, we expected the experimental parcels to intercept and process more rain and runoff than control parcels with mowed lawns. In contrast to these expectations, Table 1 shows that control parcels intercept and store as much rain as the rain garden parcels. Consistent with expectations, however, some of the experimental parcels showed statistically significant correlations of soil moisture increment and initial rate of decline that indicate dependence of the rate of decline on the concentration gradient. The control parcels seemed to have more variable rates of decline that were independent of soil moisture increment. The other experimental parcels either had similar but non-significant associations of soil moisture increment and initial rate of decline or had anomalous behavior potentially due to extraneous site factors. Thus, in respect to infiltration rates, the evidence suggests that rain garden parcels absorb rainfall and runoff faster than control parcels. Finally, with respect to evapotranspiration, the control parcels process stored soil moisture at least as well if not better than rain gardens. Because mowed lawns in control parcels cover a greater area than rain gardens in experimental parcels, it is possible that unmodified parcels absorb and process more rainfall and runoff than parcels with rain gardens.